The positive impact of a bright, vibrant smile cannot be understated. Quite often, flashing your pearly whites can help make a good first impression, accentuate your natural beauty, and even bring a smile to the face of others. At Bethesda Sedation Dentistry, our cosmetic dentists understand the importance of a beautiful smile, which is why we offer several professional-grade teeth whitening options for individuals seeking to lighten the appearance of their teeth. Designed to significantly diminish signs of staining and discoloration that accumulate over time, these in-office and at-home techniques can brighten teeth by several shades while improving the confidence you have in your smile. While regular brushing, flossing, and routine dental cleanings can certainly help protect against discoloration, the teeth will eventually fall victim to some degree of staining and/or yellowing. This is generally the result of what we eat and drink on a consistent basis, such as coffee, red wine, soda, berries, pasta sauce, and more. Additionally, habits like smoking and/or tobacco use can darken the teeth over time. While over-the-counter methods may sometimes be able to provide acceptable results for certain individuals, teeth whitening treatments from a dental professional tend to be much more effective in both the short-term and long-run. These advanced techniques generally involve innovative application technologies and top-of-the-line bleaching formulas that are not available over-the-counter, often creating results that are notably superior and longer lasting. At our practice, Dr. Deb and Dr. Rob offer both in-office and at-home whitening techniques. Each method varies in strength, so our dentists will evaluate the type and degree of staining you have before recommending the most appropriate option based on your needs, goals, and lifestyle. GLO™ professional teeth whitening is a state-of-the-art, in-office bleaching technique that can make teeth up to five shades brighter. To begin treatment, a special lip protectant and gingival barrier will be applied to reduce the risk of harming soft tissues of the mouth. The teeth whitening gel is then gently brushed onto the top and bottom row of teeth, and the flexible GLO™ mouthpiece is carefully positioned so that all teeth are completely surrounded. Once in place, the mouthpiece is activated to employ a combination of heat and light energy that works to accelerate the efforts of the whitening gel. After eight minutes, the mouthpiece is removed and the gel is suctioned off. The process is then repeated three more times for a total of 32 minutes. Following the last application, the teeth and gums are cleaned, and the results of treatment are apparent immediately. 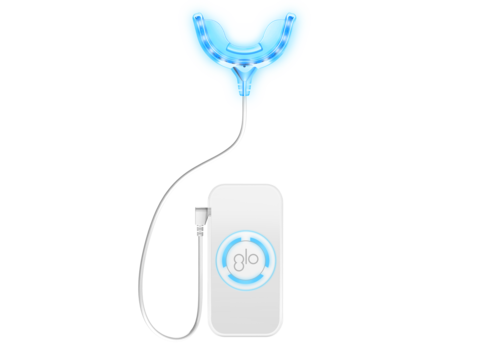 In addition to in-office treatment, patients who receive GLO™ professional teeth whitening will be provided a GLO™ take-home kit for maintenance. Dr. Deb or Dr. Rob will explain how to use this kit for optimal comfort, safety, and results—helping to ensure you maintain a bright, beautiful smile for a long time to come. Our dentists can make customized teeth whitening trays for patients who wish to whiten their teeth in the comfort of their own homes. These trays are designed to sit flush against all of your teeth, and instructions for when and how long to wear them will be determined based on your unique needs and desires. Only the materials provided by Dr. Deb or Dr. Rob can be safely used for teeth whitening with the trays. After completing the treatment, your dentist will examine your teeth and discuss the results with you. Concerned About the Safety of Teeth Whitening? 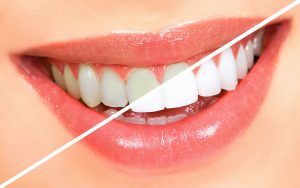 When performed by a skilled and experienced dental professional, teeth whitening is considered both safe and effective. There are usually no major side effects, though patients might experience some minor sensitivity lasting about 48 hours after treatment. Our dentists may discourage treatment if you have sensitive teeth, periodontal disease, worn tooth enamel, or if you are pregnant or breastfeeding. For more information about our teeth whitening procedures, or if you are interested in scheduling an appointment at our practice, please feel free to contact us today. Want longer-lasting results than any teeth whitening solution can provide? Discover how porcelain veneers can improve the appearance of your teeth by correcting discoloration, gaps, misalignments, and more.